LinkedIn has neglected two big opportunities Facebook is now capitalizing on: helping lower-skilled workers and people who aren’t actively looking for a job. Today Facebook is rolling out a slew of new Jobs features we spotted it testing last year. They could hurt LinkedIn’s growth prospects and divert recruiting ad dollars. Business Pages will now be able to post job openings to the News Feed through the status update composer, and host them on a Jobs tab on their Page. When users see these, they can hit an “Apply Now” button to instantly send an application through Facebook Messenger. Facebook will pre-fill the user’s name and profile picture to speed up the process. These features are now becoming available to all U.S. and Canada business Pages. Facebook also could start earning revenue from the feature, as businesses can pay to turn these posts into ads so they reach more people in the feed. Businesses could also get some viral help as users re-share openings to their friends, or tag people that they know are looking for a job. Facebook’s VP of Ads and Business Platform Andrew “Boz” Bosworth tells me the company wanted to see “How can we make Facebook more useful in your everyday life?” They found small businesses were having trouble hiring, and most people are open to a better, higher-paying job, even if they’re satisfied with their current employment. That’s where LinkedIn has fallen short. It’s become a destination for purposeful job seekers looking for medium- and high-skilled roles. But for people seeking part-time or hourly jobs, LinkedIn’s focus on your resume and education might have made them hesitant to sign up, and it’s not designed for applying to lots of jobs en masse. And unless you’re unemployed or actively seeking a new job, you might not have a reason to visit LinkedIn. Yet these people and the businesses looking to hire them are on Facebook every day. A News Feed post or ad can reach a job candidate who didn’t even know they were interested in switching companies. And the “Apply Now” button makes sending your application through Facebook a quick and seamless part of your socializing experience. There is one problem: Some job applicants are skittish about employers doing background checks on their social media profiles. Applying directly through Facebook might make that even easier for a company. 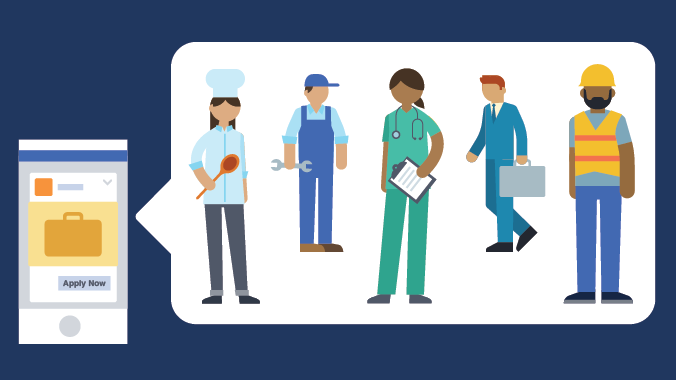 Eventually Facebook says it will consider doing more relevancy sorting of Jobs posts and the tab to show people roles that match their education level or work experience. There are also opportunities in recruiting if Facebook allowed a company’s existing employees or viewers of these posts to see which of their friends might be a good fit for an opening. If the Messenger channel becomes popular for receiving applications, it may also need tools to help those hiring manage all their inbound interest. While LinkedIn might be the leader in the employment social network space, its 467 million user count is dwarfed by Facebook’s 1.86 billion. And Facebook’s users come back every day for a variety of reasons, giving them a chance to serendipitously hear about and apply for a dream job they didn’t know they wanted.